Where can i get a LV top tube pad, OMFG that's fricking AWEsoME!!! Biggest shame ever. There's a Super Record 6speed gruppo weeping somewhere right now. Brooklyn Jack Crank Biggest shame ever. There's a Super Record 6speed gruppo weeping somewhere right now. is itt wrong that i like this? jack is fixed gear god. Are we all fashionista's now? What's wrong with admitting that just because you don't like something, that the owner might, and that that's cool. Let him without a fashion sin cast the first stone. but jack is a god, i dare not anger him. Look at the cranks Jack. It's a C-record gruppo that's weeping not a SR. I met up with your mate btw last nite. Gonna get the shirt ! ! I'm psyched. 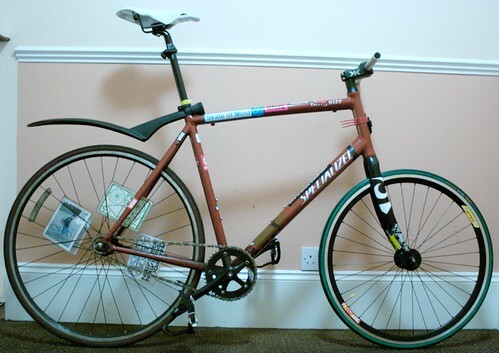 Im sure this guy is on the forum, hes Belgian and bought the frame and forks only for something silly like 70 euros. DT Swiss RR 1.2 rims. Noice. chris crash but jack is a god, i dare not anger him. velocity boy Are we all fashionista's now? 'I like how my bike looks, I don't like how this person's bike looks'.